The PowerApps platform is designed for business experts to build apps without traditional application code. Professional developers can use Azure Functions to extend the capabilities of PowerApps, while shielding PowerApps app builders from the technical details. You build an app in this topic based on a maintenance scenario for wind turbines. This topic shows you how to call the function that you defined in Create an OpenAPI definition for a function. The function determines if an emergency repair on a wind turbine is cost-effective. For information on calling the same function from Microsoft Flow, see Call a function from Microsoft Flow. Prepare sample data in Excel. Add a connection to the API. Create an app and add data sources. Add controls to view data in the app. Add controls to call the function and display data. Run the app to determine whether a repair is cost-effective. The OpenAPI feature is currently in preview and is only available for version 1.x of the Azure Functions runtime. An active PowerApps account with the same sign in credentials as your Azure account. Excel and the Excel sample file that you will use as a data source for your app. Complete the tutorial Create an OpenAPI definition for a function. You have an OpenAPI definition for your function, from Create an OpenAPI definition for a function. 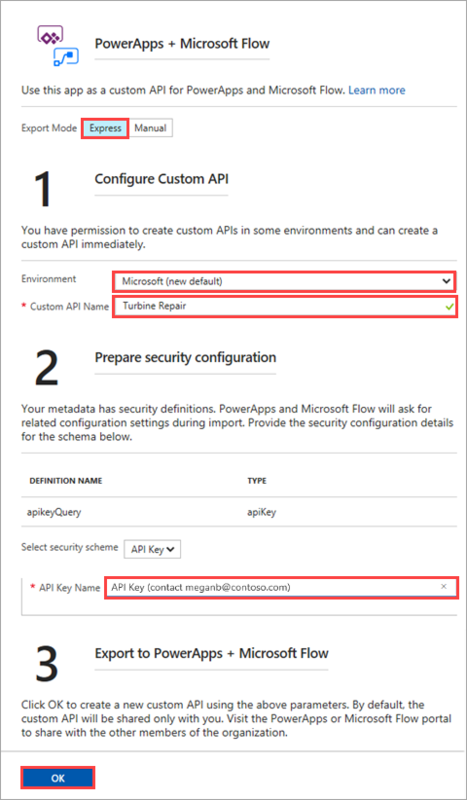 The next step in this process is to export the API definition so that PowerApps and Microsoft Flow can use it in a custom API. Remember that you must be signed in to Azure with the same credentials that you use for your PowerApps and Microsoft Flow tenants. This enables Azure to create the custom API and make it available for both PowerApps and Microsoft Flow. 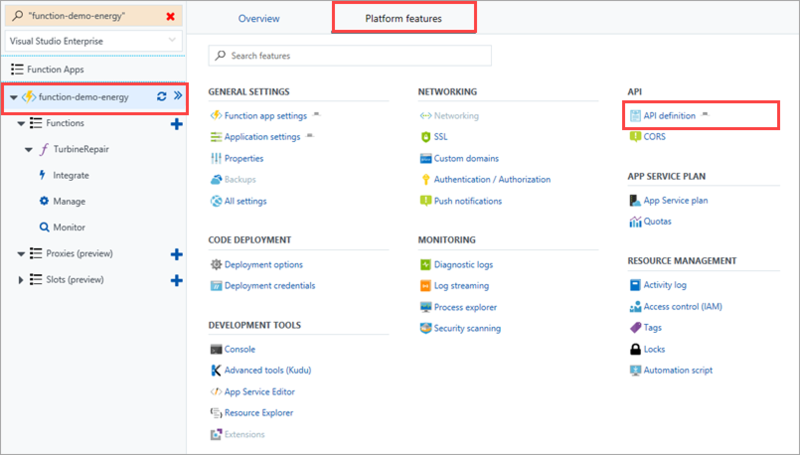 In the Azure portal, click your function app name (like function-demo-energy) > Platform features > API definition. Click Export to PowerApps + Flow. In the right pane, use the settings as specified in the table. Export Mode Select Express to automatically generate the custom API. 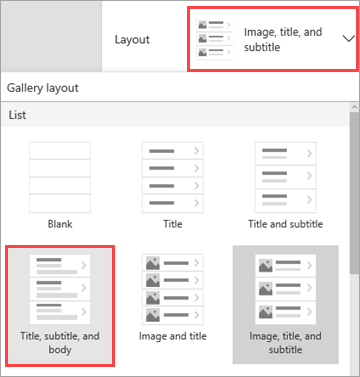 Selecting Manual exports the API definition, but then you must import it into PowerApps and Microsoft Flow manually. For more information, see Export to PowerApps and Microsoft Flow. Environment Select the environment that the custom API should be saved to. For more information, see Environments overview (PowerApps) or Environments overview (Microsoft Flow). Custom API Name Enter a name, like Turbine Repair. API Key Name Enter the name that app and flow builders should see in the custom API UI. Note that the example includes helpful information. Click OK. The custom API is now built and added to the environment you specified. 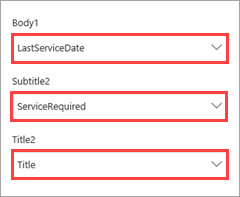 The custom API (also known as a custom connector) is available in PowerApps, but you must make a connection to the API before you can use it in an app. 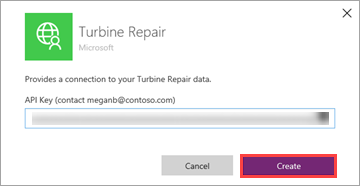 Click New Connection, scroll down to the Turbine Repair connector, and click it. Enter the API Key, and click Create. If you share your app with others, each person who works on or uses the app must also enter the API key to connect to the API. This behavior might change in the future, and we will update this topic to reflect that. Now you're ready to create the app in PowerApps, and add the Excel data and the custom API as data sources for the app. 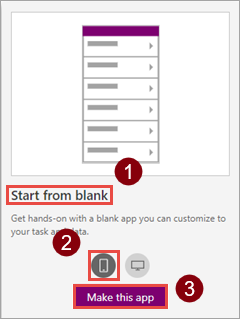 In web.powerapps.com, choose Start from blank > (phone) > Make this app. 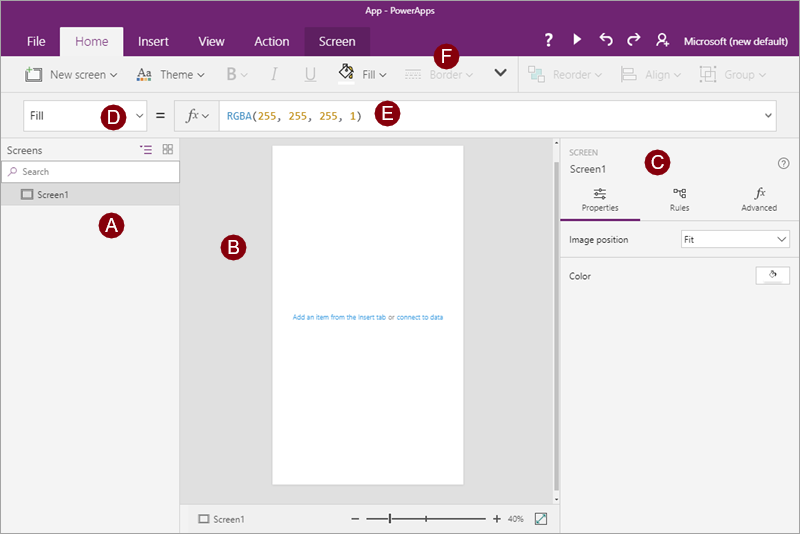 The app opens in PowerApps Studio for web. The following image shows the different parts of PowerApps Studio. Add the Excel file as a data source. On the app canvas, choose connect to data. On the Data panel, click Add static data to your app. Normally you would read and write data from an external source, but you're adding the Excel data as static data because this is a sample. 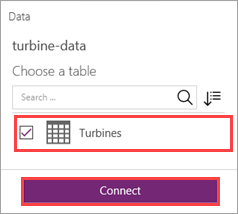 Navigate to the Excel file you saved, select the Turbines table, and click Connect. Add the custom API as a data source. On the Data panel, click Add data source. 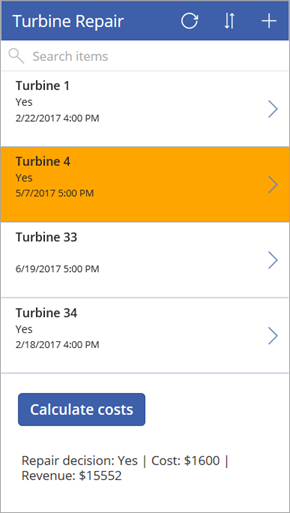 Now that the data sources are available in the app, you add a screen to your app so you can view the turbine data. 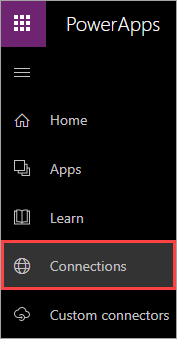 On the Home tab, click New screen > List screen. 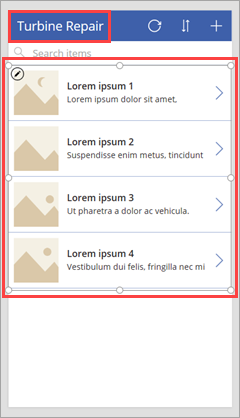 PowerApps adds a screen that contains a gallery to display items, and other controls that enable searching, sorting, and filtering. Change the title bar to Turbine Repair, and resize the gallery so there's room for more controls under it. 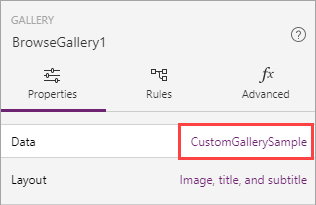 With the gallery selected, in the right pane, under Properties, click CustomGallerySample. 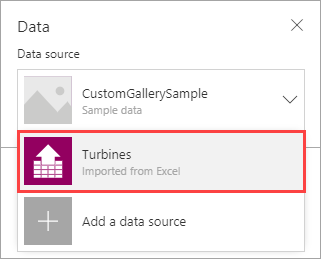 In the Data panel, select Turbines from the list. The data set doesn't contain an image, so next you change the layout to better fit the data. Still in the Data panel, change Layout to Title, subtitle, and body. As the last step in the Data panel, change the fields that are displayed in the gallery. With the gallery selected, set the TemplateFill property to the following formula: If(ThisItem.IsSelected, Orange, White). Now it's easier to see which gallery item is selected. You don't need the original screen in the app. In the left pane, hover over Screen1, click . . ., and Delete. Click File, and name the app. 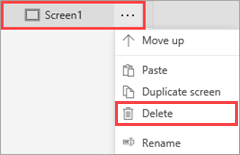 Click Save on the left menu, then click Save in the bottom right corner. There's a lot of other formatting you would typically do in a production app, but we'll move on to the important part for this scenario - calling the function. 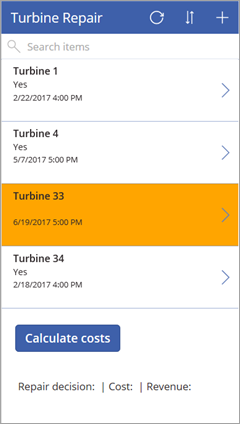 You have an app that displays summary data for each turbine, so now it's time to add controls that call the function you created, and display the data that is returned. You access the function based on the way you name it in the OpenAPI definition; in this case it's TurbineRepair.CalculateCosts(). Drag the button and the label below the gallery, and resize the label. Select the button text, and change it to Calculate costs. The app should look like the following image. Select the button, and enter the following formula for the button's OnSelect property. Clears the collection DetermineRepair to remove data from previous calls. A collection is a tabular variable. Assigns to the collection the data returned by calling the function TurbineRepair.CalculateCosts(). The values passed to the function come from the EstimatedEffort and MaxOutput fields for the item selected in the gallery. These fields aren't displayed in the gallery, but they're still available to use in formulas. Select the label, and enter the following formula for the label's Text property. This formula uses the First() function to access the first (and only) row of the DetermineRepair collection. It then displays the three values that the function returns: message, costToFix, and revenueOpportunity. These values are blank before the app runs for the first time. The completed app should look like the following image. You have a complete app! Now it's time to run it and see the function calls in action. 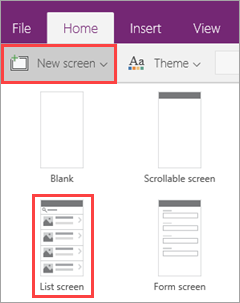 In the upper right corner of PowerApps Studio, click the run button: . Select a turbine with a value of Yes for ServiceRequired, then click the Calculate costs button. You should see a result like the following image. 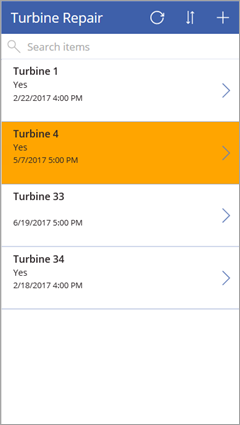 Try the other turbines to see what's returned by the function each time. To learn more about PowerApps, see Introduction to PowerApps. 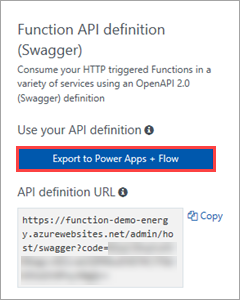 To learn about other interesting scenarios that use Azure Functions, see Call a function from Microsoft Flow and Create a function that integrates with Azure Logic Apps.